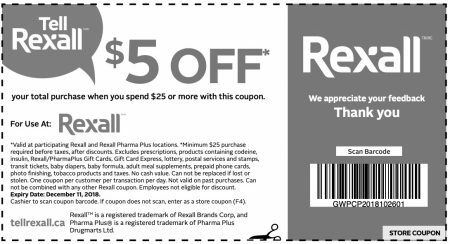 Rexall Pharma Plus just released a new printable coupon! Save $5 off when you spend $25 or more with this coupon. The coupon is valid at all Rexall stores across Canada until December 11, 2018. Make sure you read the fine print before you use the coupon as it excludes certain items. Click here to print Rexall’s $5 off $25 coupon. Click here to find a Rexall store near you.